Today is Blog Action Day. I don’t care, so won’t be doing any acting, just blogging. 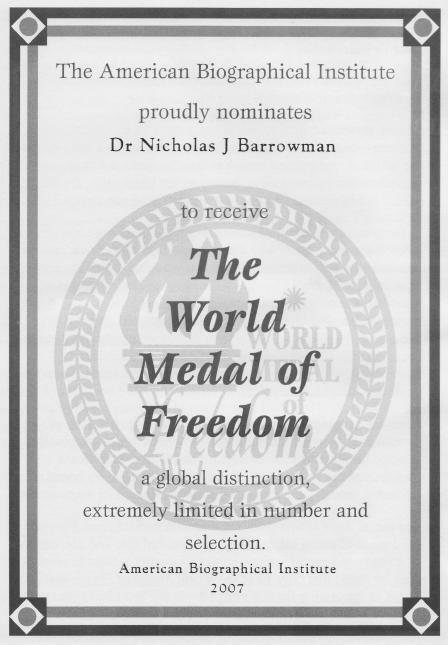 Friend to Deonandia –the inestimable Nasty Nick Barrowman— has jus been awarded the World Medal of Freedom. Let us congratulate Dr Barrowman with a well-earned raspberry, delivered with love and respect. 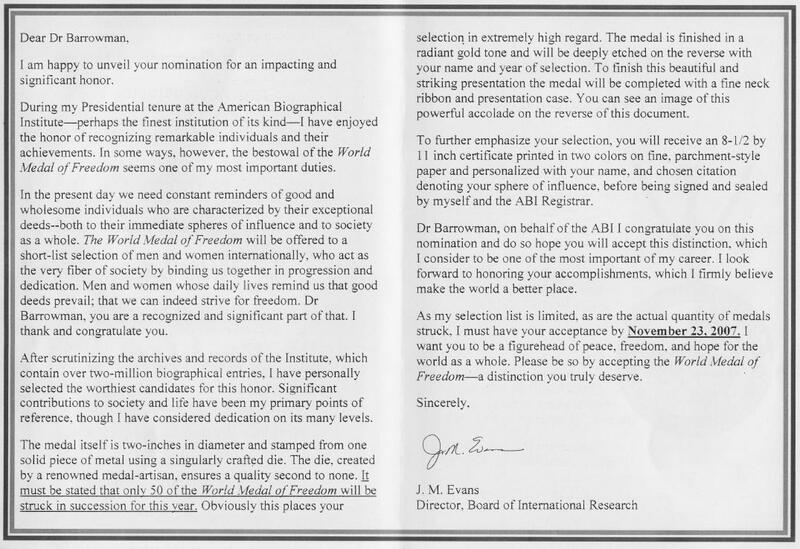 The medal, and awards like it, are offered by the American Biogaphical Institute, a vanity awards company. I’m sure the many trolls who attempt to post here are familiar with this group, given its appeal to the fragile ego set. As discussed in our various science fiction threads, the “Multiverse”, or the proposition that there exist an infinite number of parallel universes has been a popular trope in speculative science and in the more obscure niches of theoretical physics. Now comes the theory that we might be able to detect such parallel universes! I just finished reading the final Harry Potter book. This review sums up my opinion perfectly. EK Hornbeck sends us this paper on how talk of India becoming an explosive economy like China is premature. It is true that India has nowhere near as robust an economy as China. But it’s the future that warrants consideration: (a) India is English-speaking, which is attractive for Western business interests; (b) India is a Western-style democracy with a functioning judicial law system, which is needed for assurances that longterm business agreements will be upheld; China truly suffers in this regard; (c) India benefits from a much larger and better connected ex-pat community wishing to retain and build strong ties to the motherland, bringing with them more of that sweet, sweet Western currency; and (d) unlike China, India benefits from a predominantly youthful population, the economic advantages of which, the West is only now starting to understand. Relatedly, the USA this week experienced a momentous first: the first of the Baby Boom generation applied to receive Social Security benefits. (Keep in mind that the Canadian Baby Boom is a tad different from the American case.) This is the beginning of the flood, as an ocean of silver-haired elders now descends upon the unprepared US Social Security system, thus demanding greater giving from the remaining, smaller, workforce. But wait…. that’s not all! Very soon, this same cohort will begin cashing in its billions of dollars of retirement savings, pulling them from the investment accounts currently being used to prop up US industries and trade imbalances. The USA is about to experience a cash crunch, perhaps even an economic crisis. Hold on to your seats, boys and girls. The next 20 years, overall, may not be pretty.